To start, cook the rice noodles according to package directions. Typically, this requires placing the rice noodles in a heat proof bowl, covering with boiling water, and letting soak for about 10 minutes, until tender. When the noodles are done, drain well & set aside. Next, make the peanut sauce. In a small bowl, whisk together the peanut butter, water, rice vinegar, soy sauce, sesame oil, sugar, garlic powder, onion powder, and ground ginger. Set aside until you're done making the summer rolls. Place all the filling ingredients in little bowls or piles around your work surface. Fill a large flat bowl or skillet with a few inches of very warm water and place next to your work surface. Lay a damp clean kitchen towel on your work surface and get ready to make the rolls. Submerge a rice paper wrapper in the warm water until it is soft and pliable, about 15 seconds. Remove from the water, and lay flat on the damp kitchen towel. Lay down 3 or 4 mint leaves horizontally across the bottom third of the rice paper wrapper. On top of the mint leaves, add a layer of rice noodles and two strips of tofu. 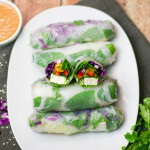 Finish off the pile with 3 basil leaves, a few tender sprigs of cilantro, a few strips of bell pepper, a few pieces of cucumber, a sprinkle of spinach, and a sprinkle of purple cabbage. Roll up the bottom of the rice paper wrapper to cover the filling. Next, fold in the left and right edges of the wrapper to close the sides of the roll. Finally, gather the filling up tightly and roll the wrap from the bottom up to the top until closed and secured. This will take a little practice. The first few you make will probably be a little over-filled or unevenly shaped, but you'll get the hang of it. Remember, it will still taste great, no matter how it looks! When the roll is done, place it on a plate and cover with a damp towel to keep the wrappers moist. Continue until you're done rolling all twelve summer rolls. When ready to eat, serve the summer rolls with small bowls of dipping sauce. Dip the end of the roll into the sauce before each bite, and enjoy!